Is Enough, Enough When It Comes To Bandwidth AT&T? Time to get back to telecom issues and leave content and services alone for a few articles. Ah, the glory days when we proclaimed at AT&T that 56 Kbit/s was all the bandwidth a business would ever need. A few years later we updated that cap to a T1 or 1.544 Mbit/s. Lately, The New AT&T proclaims that 35 Mbit/s is enough bandwidth for your TV, phone, and Internet access. Is it? Comcast does not think so. 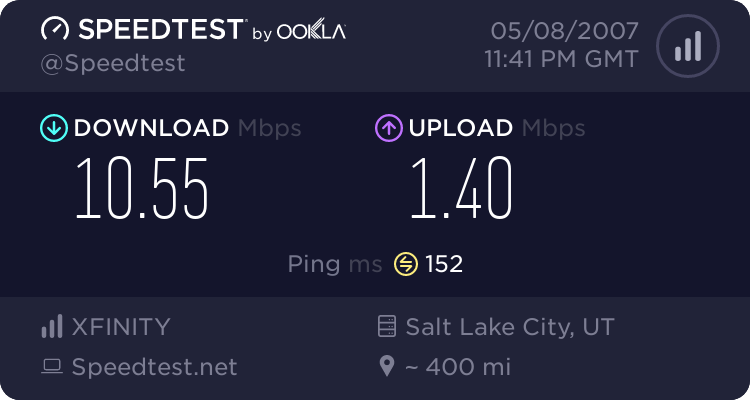 Earlier this week, Brian Roberts, CEO of Comcast, demonstrated Internet access speeds of 150 Mbit/s at The Cable Show in Las Vegas. The demonstration utilized the DOCSIS 3.0 standard to bond together the equivalent of 4 analog TV channels to obtain the desired bandwidth for the demonstration. They plan on reclaiming bandwidth on the plant to offer 100 Mbit/s Internet access to homes by moving to an all digital plant, utilizing switched digital video, reclaiming bandwidth from legacy applications, and implementing MPEG-4 compression according to Tony Werner, Comcast's CTO. Comcast is not resting on its laurels in the triple-play arms race. Additionally, Comcast will have to incorporate node splits to ensure enough bandwidth to each home. Splitting a node costs between $3.35 to $26 per home passed depending on they way that they actually split a node. About 65% of those splits are of the "logical" type that cost $3.35. A small cost compared with some of the telcos upgrade plans. Let's compare these figures to the cost of AT&T's Project Lightspeed. Also this week, AT&T announced that the capital expenditure of Project Lightspeed would increase from $4.6B to $6.5B and the number of homes passed to 18 million; down a million homes. That announcement increased price per home passed to $361 which is now about half the cost per home passed of Verizon's FiOS project that is delivering 50 Mbit/s Internet access alone. To reduce capital expenditures, AT&T relies on a fiber to the curb approach and existing copper cable for the last thousand feet which limits bandwidth to the home. In addition to the cost, AT&T depends on a completely switched digital video network to squeeze the most out of the limited bandwidth over their aging copper plant. The Microsoft software that powers their IP-TV network has proven to be less than reliable to date. Add this up: a totally new switched digital video network, the limitations of a copper infrastructure, and a multi-billion dollar build-out for a network that is barely sufficient to meet today's triple-play needs. Contrast this risky strategy with Comcast's low cost, high bandwidth network and you would think that the market would be going crazy for Comcast stock. The opposite is true. AT&T's stock keeps rising while Comcast's is holding steady after a setback in January. The market is fixated on short-term numbers instead of the long-term picture. In the triple-play arms race, Comcast is better suited to capture a greater market share with faster Internet access, a greater selection of HDTV programming, more responsive VOD, cheaper voice services, and an integrated suite of packages ala Zimbra. Despite of what Om Malik says, Comcast is delivering the innovation to make it a triple-play market leader.